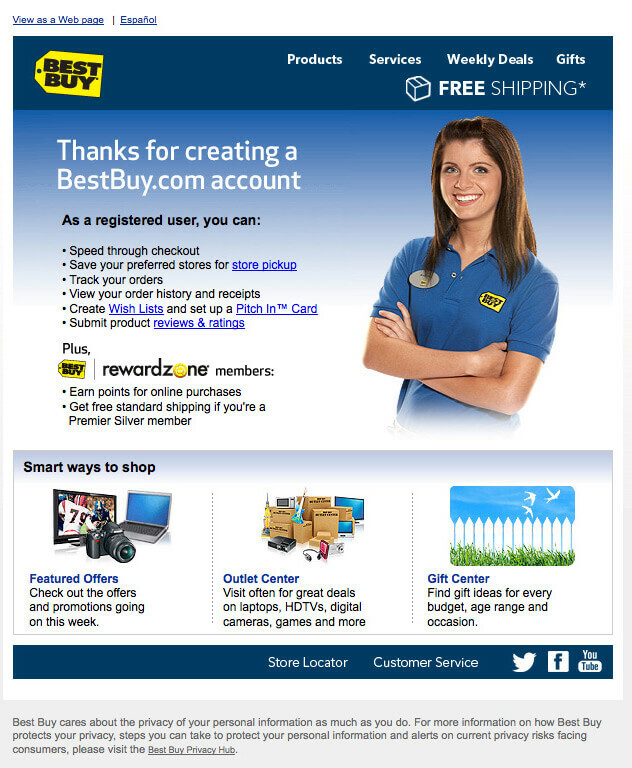 Best Buy’s Email Journey: What Marketers can Learn from It! March 22, 2016 | -by: Kevin George. We live in a technology-powered era where most of the companies are dependent on digital marketing to promote their brands. One of the important platforms of digital marketing is email marketing. Converting a prospect through email marketing is an extended journey. This journey is about a series of emails with multiple throughways and halts. While this journey might differ based on companies, the ultimate aim is to engage with email subscribers in the best possible way. But, what could be the ideal email journey for e-commerce companies to send emails from welcoming the subscribers to post-purchase, in order to nurture the leads and convert them? Well, Monks are here with some divine email examples of BEST BUY to explain the email journey in detail. The first email in the cycle after a subscriber signs up to the website is Welcome Email. Best Buy has designed a modest and sincere welcome email. They have thanked the subscriber for signing up and have simply mentioned the incentives of being a registered user. The advantage of having such a welcome email is establishing trust with your subscribers and making them feel valued. Sending an email that people would actually want to read is essential. This email is a great example of making the most out of a promotional email. Loud and clear CTAs make it difficult for email subscribers to miss the offer. Adding multiple product deals in single promotional email is a common, yet effective practice. Such emails work amazingly well because it gets the customer thinking about the possibilities of buying a product if the deal is good. Holiday & promotional emails are very much an integral part of the email journey. It is quintessential to keep the audience engaged and interested in your emails. To start with, Best Buy focuses on creating an influential pre-header text which forces the email subscribers to open the email. One important thing that Best Buy has made sure is the focus on hero image and the messages in bold above the fold. Also, creating a sense of urgency like mentioning the “date of sale” or “sale for one night only” in promotional emails is a good tactic to power the subscribers to click the CTA. Best Buy’s shopping cart abandonment email design has all the required ingredients to win back the abandoners. The message to match the price is loud and clear, which probably could be the reason for the shopper to abandon the cart. They also didn’t miss the chance to upsell in the cart abandonment mail by adding “Customers who bought this Item also bought”. While signing off, Best Buy added the USPs of buying a product from their website like low price guaranteed, store pick up option, and so on. 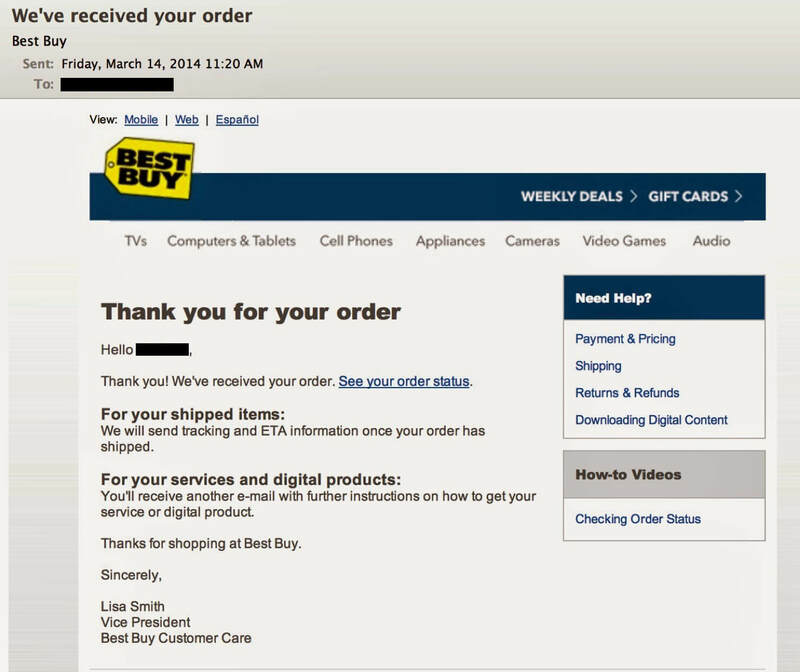 An order confirmation email is sent to the buyer as soon as he purchases the product. A good order confirmation email comprises of all the details related to a buyer’s purchase. Best Buy has included almost such information like, order status, returns and refunds, check order status online, and so on. This is a great tactic used by Best Buy in their post-purchase email. Here, Best Buy has sent an email to their buyer who has already purchased the camera. The email is about providing after sales service to buyer by asking them to come to the local store in case of any issue or query with the camera. Also, they have tried to upsell the products like storage devices, tripods, and other accessories that can complement the camera. This email sets a worthy example of offering a good customer experience. It is important for every company to know what their customer think about their services. Hence, an email seeking review and rating is necessary. Review email is the last email in the cycle before the re-engagement emails. Best Buy has kept its review email simple and to the point. 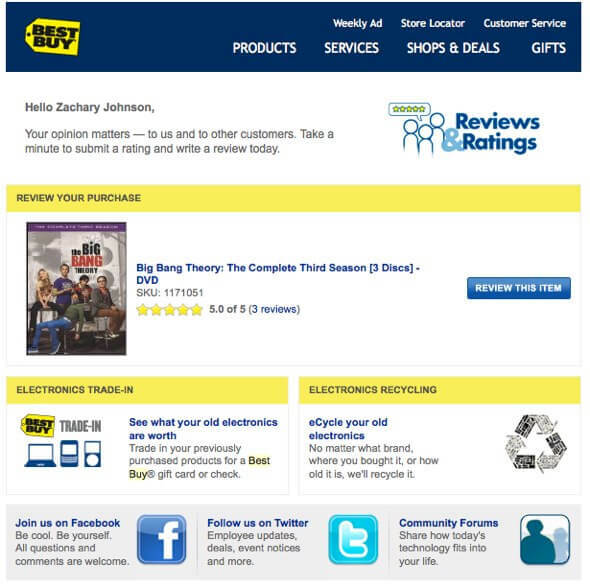 Apart from asking for reviews, Best Buy has added large social icons in the email to keep up the customer engagement in social media. As an inbound marketer, it becomes quintessential for you to take care of your subscribers through email journey as according to one of the surveys marketers with successful email campaigns derive the ROI of $38 on the investment of $1. EmailMonks can help you attain the benefits of this ROI, by sending your subscribers holy & divine emails.